Carousel Mills is a manufacturer of high-end, all-natural fiber rugs, carpet and tapestries. You may not be familiar with the brand, but you should recognize the style. One of the few mills not located in Dalton, Ga., Carousel was started more than 34 years ago in the Santa Monica, Calif. garage of founder Max Petrich. Soon after, they relocated to Ukiah, about 110 miles north of San Francisco. Carousel’s rugs are private-labeled for several interior design showrooms, though by now you should know that, when it comes to cleaning, it is the rug’s construction that counts, not the name. Carousel proclaims itself “The Natural Fiber Company” and, true to the name, uses wool, jute, linen, cotton and silk exclusively. Most of their work is custom-made and ranges in price from $65 to $1,500 per yard. The signature look of Carousel Mills is its Casual Trends style (Image 1). 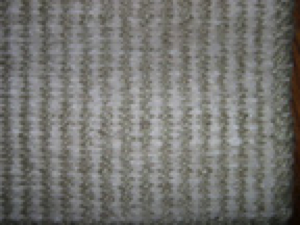 This texture is produced on a handloom(Image 2). The wefts (in this case cotton and linen) are the rug face yarns. 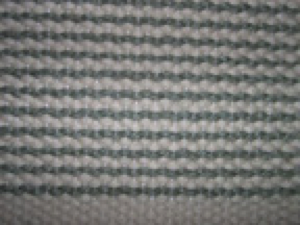 The texture is the result of hand pulling the weft yarns to create the raised pattern (Image 3). This style can be manufactured in up to 20-foot widths, so you can find it installed wall to wall and in area rugs of various sizes. Chenille is hot again, both as an upholstery fabric and in rugs (Image 4). The example seen here is cotton and jute, but Carousel also produces all-cotton chenille rugs. Chenille is a yarn with a fuzzy pile protruding from all sides. The name is derived from the French word for caterpillar (to me, the yarn looks like a big pipe cleaner). You can find chenille in wall-to-wall carpeting and rugs. Image 5 shows a 60-percent wool and 40-percent jute hand-loomed rug with a pattern created by double wefts in alternating colors. When it comes to cleaning considerations, it is clear that cellulosic browning is a big concern. Keep your cleaning solutions in the neutral pH range and look for products that have the WoolSafe logo. Products that display this logo have passed the laboratory colorfastness standard. Drying the rugs upside down with an air mover blowing across the back of the rug is an old trick of the trade. This will allow any browning to wick to the rug’s back, and will not show when the rug is returned to the homeowner’s floor (do not have the air blow under the rug; this will result in the browning on the face yarns). In good weather the rugs can be dried face up in the sun. Be sure all cleaning chemicals are completely rinsed out of the rug before putting it in the sun. Another problem to inspect for is wear damage to the warp yarns. In Image 1, note how thin they are. When exposed to foot traffic they will break, causing the rug to fall apart. Also, check the warps for dry rot, which will cause the rug to disintegrate. Carousel is also known for custom hand-tufted rugs (Image 6). First, a plain-woven cotton material is stretched over a frame. 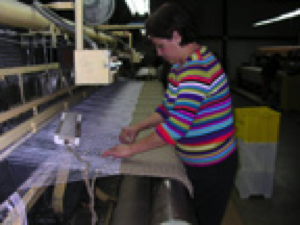 The design is sketched on the cotton primary backing, and then a pneumatic tufting gun is used to apply the face yarns. After tufting, the rug is removed from the frame and placed pile down on the floor. A back coating of latex is then applied. A secondary backing may be applied directly onto the wet latex to give dimensional stability and protect a wood floor from scratches. Custom hand-tufted rugs can be cut pile or loop. The loop style is often called “hooked,” but a hooking tool is not used for this construction, as a tufting gun is much faster. Hand-tufted rugs are always best dried flat – not placed on a dry pole. 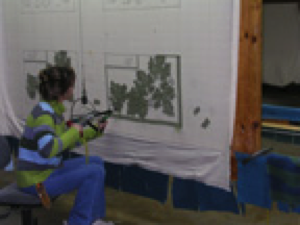 Marks or creases can result and may not be correctable. Another important cleaning consideration for these products is the possible de-lamination of the backing material from wear and tear or animal urine. All latex contains a filler to reduce cost, like gravel in a concrete mixture. The filler (often marble dust) will take up space, but has no adhesive properties. Too much filler will cause a breakdown of the latex and a separation of the backing from the rug. Also, keep in mind that the back hems (stitching of the primary backing to the secondary backing) can come unglued over time. This is a potential repair for the rug specialist, and should help reinforce in your mind why it is so important to always inspect the back of the rug in addition to the rug face. Learn to recognize rugs from Carousel Mills. They can be expensive to replace if the proper cleaning procedures are not followed.